Citrine: Mineral information, data and localities. From citrina (color as yellow as citron). A yellow to yellow-orange or yellow-green variety of quartz. A yellow-green citrine crystal with smoky phantoms. The cause of the color is still under debate. 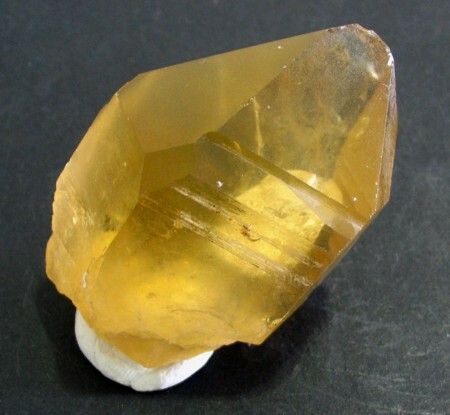 At least some citrine is colored by aluminum-based and irradiation-induced color centers related to those found in smoky quartz (Lehmann, 1972; Maschmeyer et al., 1980). 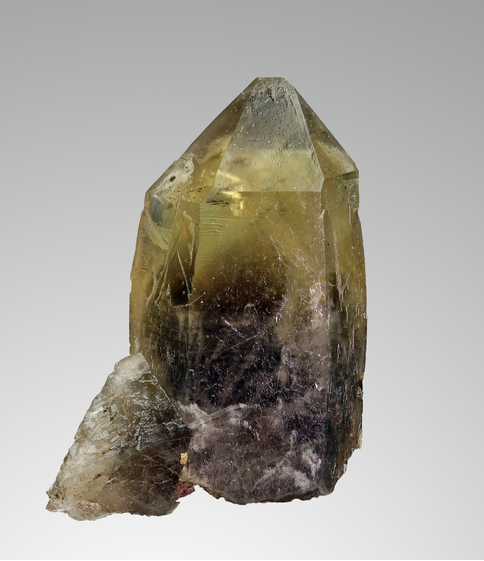 Accordingly, transitions to smoky quartz ("smoky citrine") exist, many citrines show smoky phantoms. Like smoky quartz, these types of citrines pale when heated above 200-500°C and turn yellow again when irradiated (Lehmann, 1970). There appear to be at least two types of yellow Al-based color centers with different thermal stability (Schmetzer, 1988). Since the yellow color centers are often more stable than the smoky color centers, some smoky quartz can be turned into citrine by careful heating (Nassau and Prescott, 1977). 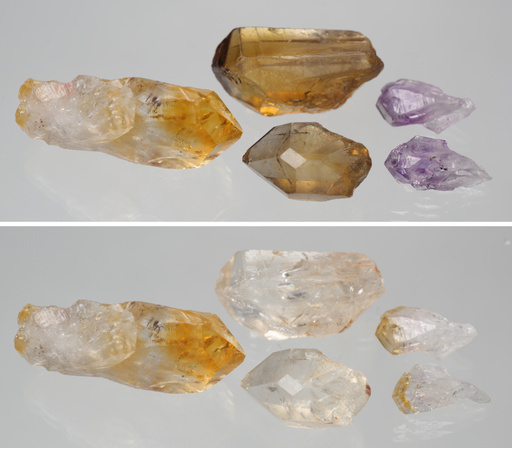 Natural citrine, as well as citrine produced by heating smoky quartz, is dichroic in polarized light. It has also been suggested that iron is the cause of color, as artificial crystals grown in an iron-bearing solution turn out yellow. However, the dichroic behavior of the lab-grown crystals differs from that in natural citrine (Rossmann, 1994). 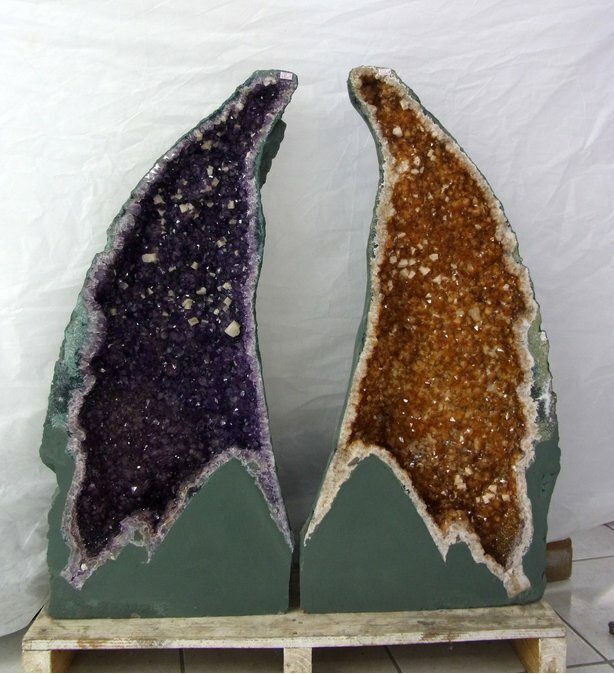 An amethyst geode cut into 2 halves, the right one was heated to turn the amethyst into "citrine". Note: Natural citrine is very rare. Large quantities of amethyst, usually of lesser quality, are heated to turn it yellow or orange and sold as "citrine." Because the color is now caused by finely distributed iron minerals (mostly hematite and goethite), heated amethyst is not citrine in the strict sense, and also shows no dichroism in polarized light. 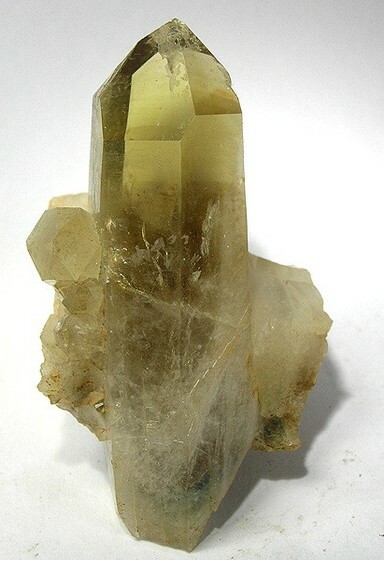 Thin coatings of iron oxides on colourless quartz, as well as inclusions of yellow iron oxides ("limonite"), may simulate citrine. Quartz colored by inclusions, or coatings, of any kind is not called citrine. Visit gemdat.org for gemological information about Citrine. Smoky Quartz 22 photos of Citrine associated with Smoky Quartz on mindat.org. Quartz 20 photos of Citrine associated with Quartz on mindat.org. Amethyst 16 photos of Citrine associated with Amethyst on mindat.org. Muscovite 9 photos of Citrine associated with Muscovite on mindat.org. Danburite 8 photos of Citrine associated with Danburite on mindat.org. Hematite 7 photos of Citrine associated with Hematite on mindat.org. Calcite 7 photos of Citrine associated with Calcite on mindat.org. Elbaite 7 photos of Citrine associated with Elbaite on mindat.org. Fluorite 5 photos of Citrine associated with Fluorite on mindat.org. Goethite 4 photos of Citrine associated with Goethite on mindat.org. 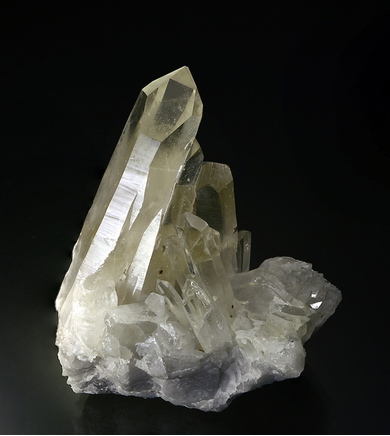 Citrine is a variety of quartz which is usually quite harmless unless broken or powdered. Broken crystals and masses may have razor-sharp edges that can easily cut skin and flesh. Handle with care. Do not grind dry since long-term exposure to finely ground powder may lead to silicosis. Dana, 1892, 187 - "Syst. Min. 6th Ed"
Chudoba, K. F. (1962) Some relations between the causes of amethyst, smoky quartz, and citrine colors as given by modern science. Mineralogicheskii Sbornik (Lvov): 16: 91-105. Samoilovich, M.I., Tsinober, L.I., Kreishop, V.N. 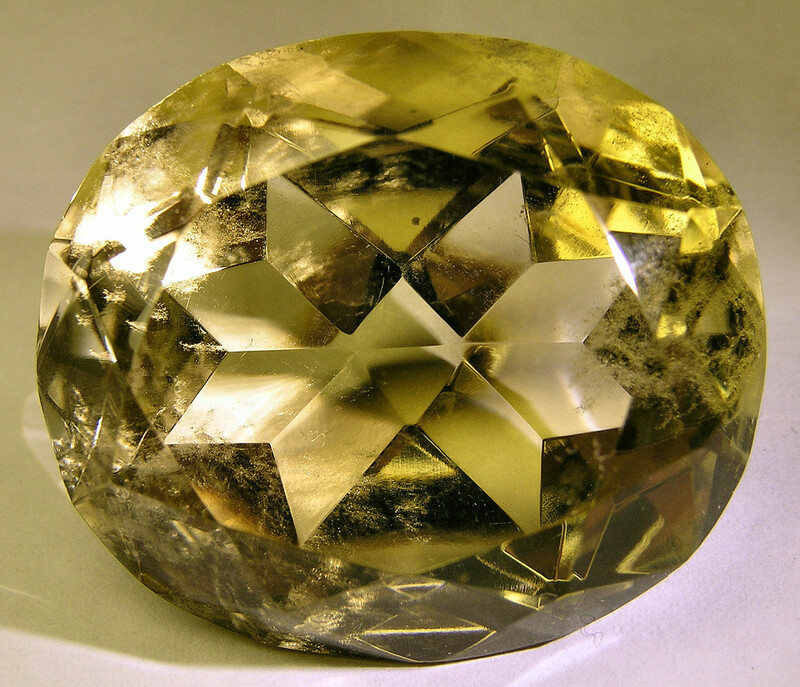 (1969) The nature of radiation-produced citrine coloration in quartz. Soviet Physics-Crystallography: 13: 626-628. 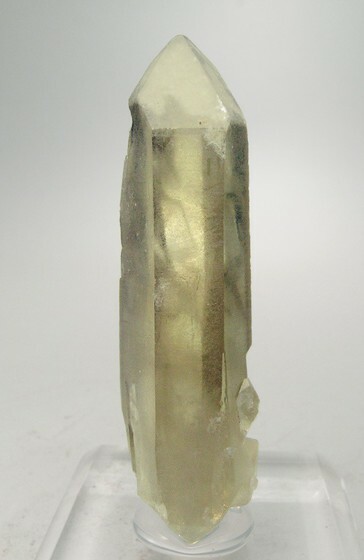 Lehmann, G. (1972) Yellow color centers in natural and synthetic quartz. Physik der Kondensierten Materie: 13: 297-306. Nassau, K., Prescott, B.E. (1977) Smoky, blue, greenish yellow, and other irradiation-related colors in quartz. Mineralogical Magazine: 41: 301-312. Schmetzer, K. (1988) Thermal stability of yellow color centers in natural citrine. Neues Jahrbuch für Mineralogie, Monatshefte: 2: 71-80. Rossman, G.R. (1994) Colored varieties of the silica minerals. In: Reviews in Mineralogy, Vol.29, Silica - Physical behavior, geochemistry and materials applications, Mineralogical Society of America. Pan, Y., Nilges, M.J., Mashkovtsev, R.I. (2008) Radiation-induced defects in quartz. II. 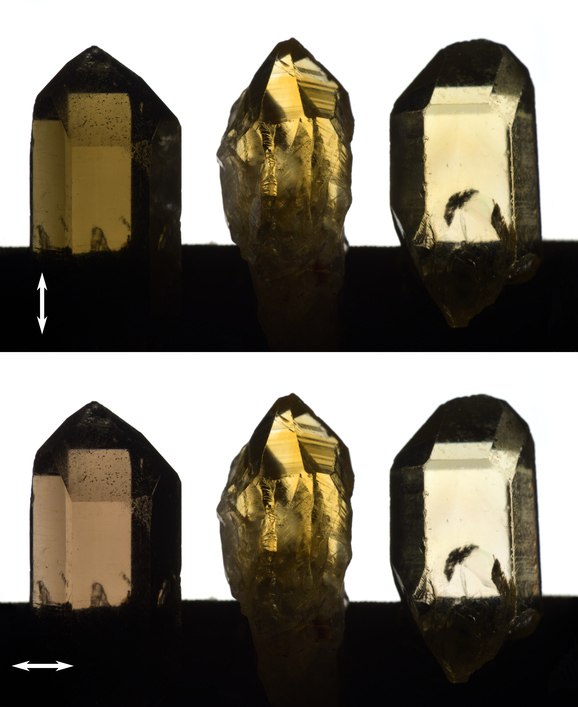 Single-crystal W-band EPR study of a natural citrine quartz. Physics and Chemistry of Minerals: 35: 387-397. The following Citrine specimens are currently listed for sale on minfind.com. RIEDEL, Christian (2011): Schmucksteine aus Österreich.- Gemmo News, 31, 3, Wien. - Hans Commenda, in: Übersicht der Gesteine und Mineralien Oberösterreichs, II. Minerale. Vasconcelos, P.M., Wenk, H.-R., Rossman, G.R. (1994) The Anahí Ametrine Mine, Bolivia. Gems & Gemology: 30(10): 4-23. Small quartz crystals, citrine var., in a chalcedony geode collected in August 1996 by Prof. Paulo César Pereira Neves (USP - São Paulo University), co-author with Dr. Daniel Atencio of "Enciclopédia dos Minerais do Brasil". Sejkora, J., Hejný, M.: Minerály severní části Ratajské zóny (Českomoravská vrchovina). Časopis pro mineralogii a geologii, 1984, roč. 29, č. 2, s. 212. Arroyo, A. and Calvo, M. (1995). El cuarzo citrino de Villasbuenas (Salamanca). Revista de minerales. 1: 86-89. Bauer, M. (1904) Precious Stones. Volume II. Dover Publications. Rocks & Min. :63:122; Stone, et al (1973). Carnahan, V. (1967), Minerals of Los Angeles County, part 1, Catalina Island, Palos Verdes and Soledad Basin: Los Angeles County Natural History Museum Alliance Quarterly: 6(2): 27; Pemberton, H. Earl (1983), Minerals of California; Van Nostrand Reinholt Press: 346. Stephenson, J. (2007), Pala District Opens Wide: Oceanview Mine Strikes It Big. Mineral News: Pala International, Fallbrook, CA. December. ⓘ Hatch Farm prospect ? Hitchcock, Edward (1835): Report on the Geology, Mineralogy, Botany, and Zoology of Massachusetts, p 489. Also, P. Cristofono collection 2009. Harvard Mineralogical Museum, no. 129369. Speiser, Robert (1978) A Quest for New Jersey Minerals: 10. (privately published). Collected by Sebastian Tauber in December 2108.